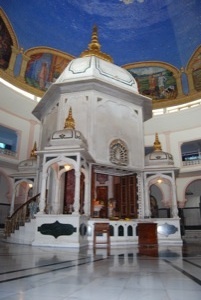 On the left side of the main temple room is a murti of ISKCON’s Founder-Acharya, Srila Prabhupada in his Vyasasana. On the right side, on the main altar are the presiding deities: the beautiful larger than life size Sri Sri Radha Madhava, surrounded by Their Ashta-sakhis (eight principal gopi friends) — Sri Lalita, Sri Champakalata, Sri Chitra, Sri Tungavidya, Sri Vishaka, Sri Indulekha, Sri Rangadevi and Sri Sudevi, along with Gauranga Mahaprabhu and Giri-Govardhana. The small Radha Madhava Deities in the altar goes out in procession during Ratha-yatra and other festivals like Jhulana-yatra (swing festival) or boat festival. These Deities also come out in procession on a chariot every Saturday after Sandhya-arati during winter from the beginning of the Kartika (Damodara) month till Gaura-purnima. 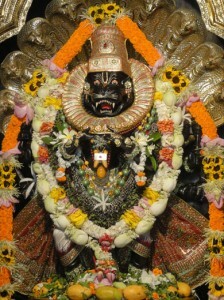 In the center of the temple is the merciful deity of Lord Nrisimhadeva. This rare form of Nrisimhadeva is known as “Sthanu-Nrisimha” and this is the only place where this particular form of Nrisimhadeva is known to be worshipped. With bent knees and in great anger with reddish eyes, He is ready to spring out of the pillar to attack the demons and protect His devotees. The Deity was installed here in 1986 after the temple was attacked by dacoits. The third altar (past Lord Nrisimhadeva), adjacent to the main temple hall is the Sri Sri Pancha-tattva temple. The most attractive and magnificent larger than life dieties of Sri Chaitanya Mahaprabhu with His associates Sri Nityananda Prabhu, Sri Advaita Acharya, Sri Gadhadhara Pandita and Sri Srivasa Thakura were installed in 2004, which was a remarkable event in the history of ISKCON. 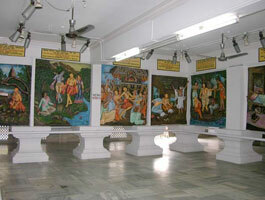 Chaitanya Exhibition is an area located inside the temple where Lord Chaitanya Mahaprabhu’s pastimes are beatifully painted and depicted on the walls in the form of bas-reliefs. A dramatic narration of the Lord’s divine pastimes in Bengali is played through an audio system. There are 4 devotees serving here. This exhibition is open from 10am to 1pm and from 4pm to 6pm. On the second floor of the Lotus building are two rooms (currently Room 18) that were used by Srila Prabhupada as his personal quarters in 1976-77. These rooms have been maintained as when His Divine Grace was present. The first room was Srila Prabhupada’s darsana room and in the next room, Srila Prabhupada’s personal Deity of Sri Mayapur-chandra and the imprint of Srila Prabhupada’s lotus feet are there. In the darsana room, a larger than than life size murti of Srila Prabhupada is present and behind this murti is a display of his personal belongings and books. On his right is a display of his books that have been translated into many languages. When you walk in through the “main gate”, on the immediate left is the straw hut where Srila Prabhupada stayed from 1972 to 1976 while the first main building (the Lotus Building) was built. A 24 hour kirtana takes place here following Srila Prabhupada’s instruction that there be continous chanting of the holy name in the dhama. On the left side are Sri Sri Nitai Gaurasundara, large neemwood Deities who traveled throughout India on Pada-yatra. These Deities also come out in procession on a chariot every Saturday after Sandhya-arati during winter from the beginning of the Kartika (Damodara) month till Gaura-purnima. 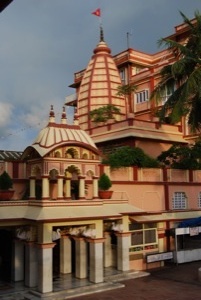 Srila Prabhupada first lived in a small hut near the campus’s main gate. 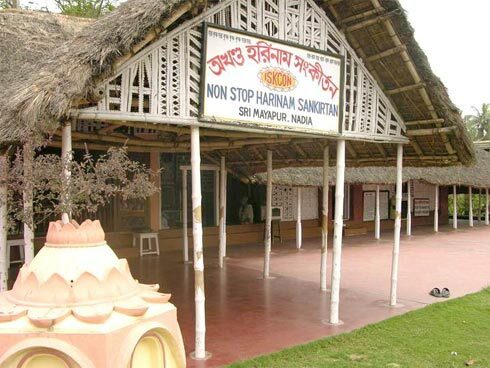 That was the first structure built in ISKCON Sri Mayapur. It is still being maintained today according to Srila Prabhupada’s desire. He instructed devotees to perform Harinama Kirtana 24 hours a day throughout the year in Sri Mayapur. Srila Prabhupada’s hut became the place of nonstop Harinama Kirtana in 1990 during Gaura Purnima. Since then the singing of Hare Krsna Hare Krsna Krsna Krsna Hare Hare / Hare Rama Hare Rama Rama Rama Hare Hare has continued unremittingly despite huge floods during the years 1999, 2000 and 2006. In this service take part 16 devotees. There are 8 shifts of 3 hrs each. 4 groups of 3 devotees each take part in each shift, once during the day and once at night. The department is determined to continue this 24 hour Harinam Kirtana eternally and please Srila Prabhupada by this service.